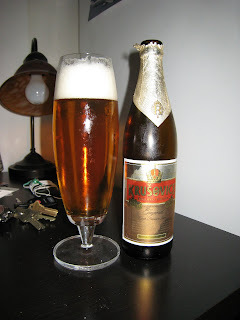 This is probably the second most popular Czech beer behind Urquell and I can definitely see why. The Czechs are just much better than we are at making beer. In fact, the average Czech consumes 8.5 bottles of beer a week per person. And that includes women and children. This beer isn't gimmicky like every beer in this country. It is just plain good. The hops are well balanced. There is a good head that quickly dissipates. The color is perfectly golden. It is slightly sweet, and has serious drinkability. In fact, when I was in the Czech Republic, I drank 14 liters of beer in 5 days including many Krusovices. I can't wait to get back over there and enjoy these bastards in a good pivnice.